There are 28 posts in this thread, and it has been viewed 20302 times. How would you rate World Heroes Perfect? 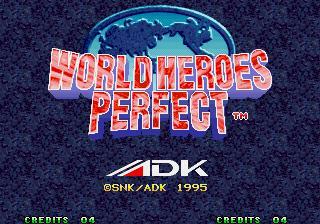 This week's game is the fourth and final installment in the World Heroes series by ADK: World Heroes Perfect. 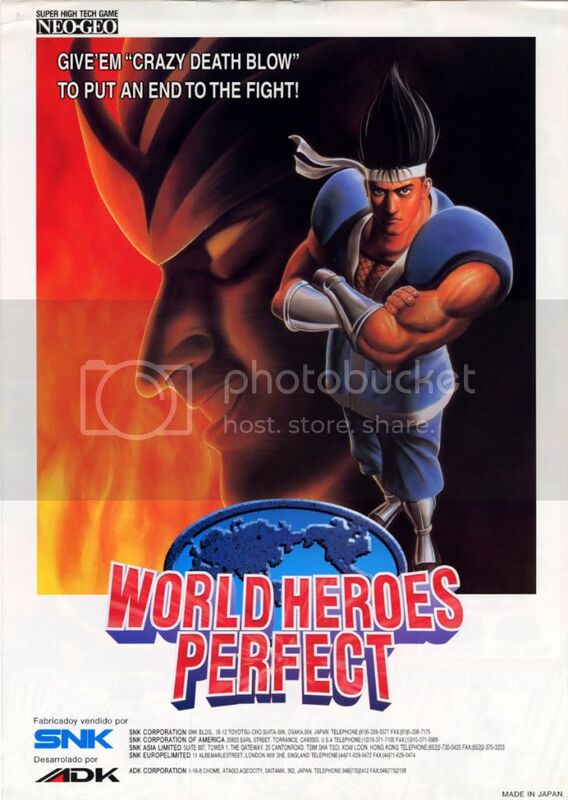 World Heroes Perfect features some significant changes from the previous games in the series and is regarded by many as the best in the series. How do you feel about the game? Please vote in the poll and share your thoughts in this week's Game of the Week discussion. Using a time machine the scientist Dr. Brown has summoned some of the strongest fighters in history to do battle against each other and decide once and for all who is the greatest. There are a total of 17 characters to choose from, 2 bosses and 1 hidden character. Zeus, the final boss from World Heroes 2 Jet, is now a sub boss and the final battle in this game sees the return of the powerful alien fighter Dio from World Heroes 2 known here as 'Neo Dio'. Son Gokuu is a hidden character who randomly appears to challenge you. The control scheme has changed significantly from the earlier games. 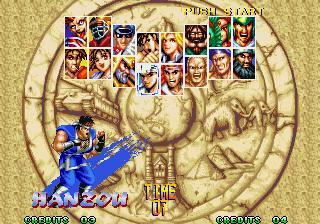 In the previous games there were four basic attacks performed with only two buttons. In World Heroes Perfect there are now a total of three punches and three kicks. 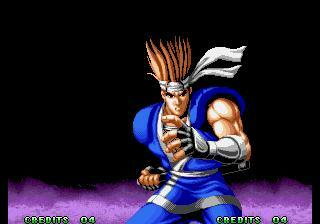 Heavy punches and kicks are performed in the same way as in Samurai Shodown: by pressing two buttons together. Each character can now do a unique special attack by pressing A,B and C at the same time. Air blocking is another new addition to the gameplay. The characters now have a 'Hero' super meter which gradually fills as you land attacks on the opponent. Once the Hero gauge is full a character's special moves become enhanced (EX moves) and do more damage. When a fighter's energy bar starts flashing red they can perform a powerful desperation move. If the energy bar is flashing red and the Hero gauge is full a fighter can then pull off the most powerful 'Hero' Super Desperation moves. Overall World Heroes Perfect has more depth than the previous games and there's increased potential for combos. but i wasn't a fan of the overall presentation and music in comparison to its predecessors. but among the ADK fighters, it's not bad. Well they got the title right ... this is about as "perfect" as World Heros can get... but that isn't saying much. This game seriously has zero appeal to me, the characters, the music and almost everything are boring as hell. Sorry to all it's fans here at NGFL, but this game is everything I do NOT want in a fighter. On a side note: It's great to see another GOTW ! Pity that not many people have posted in this one yet, as it's been so long since we've had the chance to discuss a GOTW. Ive never really got the World Heroes game to be honest I have always found the franchise a bit weak and bland. But it has a lot of fans which is why I really should knuckle down and give them a chance. I unfortunately do not own this version I only have the first game and Jet but I fully intend to give them another bash one day. It's not on top 5 neo fighters, but i like it. Most of the characters are great, expecially the funny "historic clones" like J. Carn and Rasputin. Mudman, Captain Kidd and others are great too. It's the only World Heroes to be on neogeo fighters standard, for me. The old ones were too dated. I , much like you 2D, felt the same way. I never really liked the series and thought it was a waste of perfectly good neo carts, but one day it just kinda clicked for me, the series as a whole actually. Its not meant to be taken super seriously. Its not Real Bout, KOF and I don't think it ever really wanted to be. It is a B-movie fighter, but has just enough depth to be entertaining and fun. It has death matches!!! Just go into it that way and you'll be much better off. With that said I do enjoy the series and its cast... Now. It was not love at first sight, that's for sure. The "Perfect" installment of the (in)famous World Heroes series still remains my favorite title of the franchise. I haven't played WHP intensively so far, but from what I've seen so far I surely can judge over a few contents. The game definitely sums up all good things the series had to offer and has very nice and colourful graphics as well. BUT I still can't deny that the overall presentation of "Perfect" (and all other WH games) is trashy. A look into the character roster for example is enough for a good laugh. That's not necessarily meant from a negative viewpoint, I imagine that WHP makes a lot of fun playing the Versus mode with all these cheesy characters, moves and quotes which make one dying of laughter. 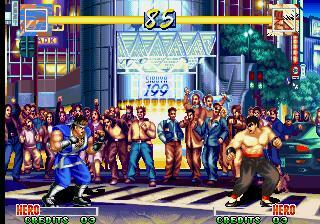 The Death Match mode of course is epic as well, very innovative for a regular fighting game, if you ask me. I love the WH series. It reminds me of smoky arcades and my misspent youth. So obviously, I quite like WHP but I prefer the presentation in Jet, and WH2 is my favourite overall. I admit they haven't aged as well as some others but they definitely have that something. World Heroes Perfect... SF3TS it is not but I play it more often. That must count for something. I'm also a huge fan of the World Heroes series in fact these games are what prompted to me buy a Neo Geo AES in the first place. The first World Heroes game with it's colourful graphics and interesting characters made a big impression on me in the arcades in the early '90s. I remember the game actually being quite popular in the arcades back then. I've always found the character designs really appealing my favourites being Hanzou, Janne, Rasputin, Brocken and J, Carn. Obviously there's plenty of humour in the World Heroes series with characters like Mudman and some of the funny win quotes but actually I do think of these as proper fighting games to be taken seriously. I do like what they did to the gameplay in WHP with more depth including increased scope for making combos, ABC moves and the Hero gauge. Like previous games in the series graphically it's very impressive with some stunning looking background stages. All in all it's an excellent fighting game. This game does seem to have quite a following and it's played regularly at Supercade. I do have a few minor complaints though. It doesn't make sense to have six basic attacks in the game when the Neo Geo only has four buttons. I don't like having to press two buttons for heavy attacks. A KOF style control scheme would have been better. The music isn't exactly memorable. The moment when Neo Dio destroys Zeus is cool in a way but it would have been better if the fight against Zeus had been a proper boss battle. Since there were no other new characters they should have made Son Gokuu a selectable character from the start. I've played the AES version a lot and have never seen Son Gokuu appear in the game. Has anyone else here been randomly challenged by him? Like Shiny WH2 is also my favourite. The death match mode, the presentation, awesome backgrounds, best music in the series and the epic final battle fighting Dio in the ruins of the Colosseum are all reasons why I love this game. plus it had the deathmatch mode. Well worth giving WH2 a try neros. It does have less depth than WHP but makes up for it in other ways I think like having the death match mode, better music, better presentation, more appealing backgrounds, an epic final boss battle and it also has bonus rounds. Some people feel it's too dated but I disagree. I found this really good video the other day showing off some combos and other useful techniques in the game. I'm still interested to hear if anyone has ever encountered Son Gokuu while playing WHP. Is there any way of triggering his appearance like you can with Kuroko in SS2 or is it totally random? I realise of course that there are cheats to be able to play as him. I find that World Heroes Perfect hardly offers better features than "World Heroes Jet". The absence of Death Matches makes no World Heroes game promising. Not only does you play with heroes from different eras, but you also travel to different eras to fight in. Mind you many of the new fighting stages are rich in detail and colour. But fancy the heroes fighting in the Genesis Period. They shouldn't be alive in that time, because there's no oxygen, only sulfur and carbon. I don't really like Neo-Dio in his golden appearance, he looked better in "World Heroes 2". Overall enjoyment in this game is very likely to be short lived. I always thought the series was generic and mundane. I did like the Death-match aspects of the other games in the series, but honestly, this fighter doesn't age well for me. I know it does have a lot of fans though - and I guess it's just a matter of preference. I like old school fighters so I think both WHP and WH2 will be for me, but there can be only one! for PS2 with all the WH's titles on. From what I can tell they are all Arcade Perfect too! Now, I never played these 'back in the day' like I did the KOF, FF's, SS's etc so I was (in terms of playing them) new to the series when WHGorgeous was released in Japan a few years back. Basically I played ALL of these games through in a row one evening so my judgement is slightly different. For me, whilst the other games were great (aside WH1 which has dated a little too heavily) I genuinely felt WHP was quite a bit better than it's predecessors. The favourite of that series for me. I'm going to back to them ALL and give them each, individually, quite a bit of time and then give a proper final judgement, as I feel there's something I'm obviously missing. And I'm not talking about Death Match either, as modes like that don't really appeal to me enough to 'make' a game better than another. metal spikes, mines, electricity, fire, oil and a circular saw. It's good fun pushing your opponent into the hazards! Here are some death matches between very good players. World Heroes 2 is the better game. Fact. Perfect is superior in many ways, except the ones that matter. Ha Ha! It looks funny Great!